Time is of the essence when one competes to purify less than a gram of protein or peptide to file for a patent and then move towards preclinical trials, or even gram and kilogram quantities for Phase II and III clinical trials. You need a fast, efficient media to provide you with non-contaminated final product. To date no manufacturer of chromatography media based on silica, agarose, soft gel or even hard gel polymeric such as STYROS® and StyrosZyme® can claim a product that does not leach and does not contaminate the final product. Over 70 phase II and III clinical trials using monoclonal antibodies have failed (as of 2010) for the treatment of sepsis alone. STYROS® and StyrosZyme® were designed to provide you with pure products in shorter time using less steps and to eliminate any risk of failure relating to the presence of impurities in your isolated and purified biopharmaceutical. The case of infant as well as adult vaccine contamination is very much a topic of debate where the regulatory authorities have yet to set global limits using the products offered by our company. FDA does not set global limits for the levels of HCP (Host Cell Protein). The presence of 1,600 ppm is still considered acceptable in today’s process of manufacturing monoclonal antibodies. Compared to traditional Silica based stationary phases, STYROS® has superior and unmatched mechanical and chemical characteristics. High capacity, high flow rate, high pressure and chemical tolerance, clean in place option, as well as the unique mechanical stability of STYROS® and StyrosZyme® provides the perfect candidate for continuous separation processes such as Simulated Moving Bed Chromatography. The limitations imposed by column size in large scale bio-processing can be overcome by the use of such stationary phases while at the same time reducing the overall size of the manufacturing facility. 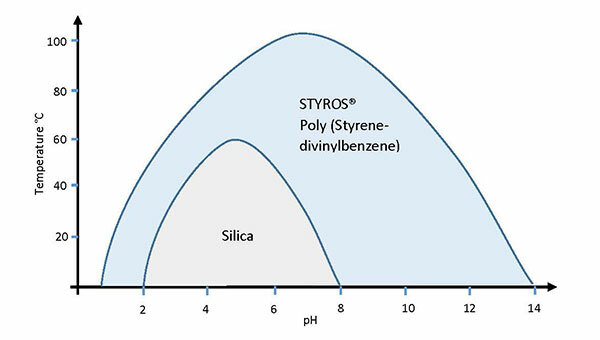 STYROS® and StyrosZyme® media are fully pervious poly (styrene-divinylbenzene) matrices manufactured by OraChrom. The unique properties of STYROS® and StyrosZyme® have been recognized by some of the most reputable biopharmaceutical manufacturers and have included it in their FDA approved production. The Full Range of Simulated Monolith™, Non Leaching Hard Gel Polymer-based HPLC Columns for High Speed, High Resolution Chromatography with New Lines of Micro Trap Columns as well as Fused Silica Capillary Columns. From Micro Trap columns of 1 nl of column volume to normal bore of 88.2 ml of column volume. Variations in polymeric anion exchanger from OraChrom Inc.